Our apartment is located in a Manhattan building formed by two circa 1900 lofts: a printing factory and one for leather work clothing. We totally renovated the 1000 sq. ft. space that had been left unchanged since conversion to dwellings the 1970s. There is now one very large open living room and an ample bedroom. We bleached the floors, stripped the cast iron columns (sealing with clear coat), cleaned the brick areas, and plastered and smoothed the vaulted ceiling. The kitchen is Ikea with a custom made island topped in charcoal caesarstone, which we also used for the bathroom vanity, which features an Italian style shower. To hold our large (for these days!) book collection we installed white metal floating shelves. Furniture was kept to a minimum: Danish sofa from Eilersen, Arper chairs and stools, Bertoncini dining room table. The overall design is light, airy and sunny (northeast exposure). 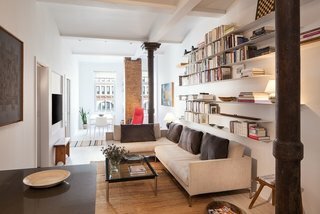 uploaded Robert and Hélène's loft through Add A Home.